Proteolysis in dairy lactic acid bacteria has been studied in great detail by genetic, biochemical and ultrastructural methods. 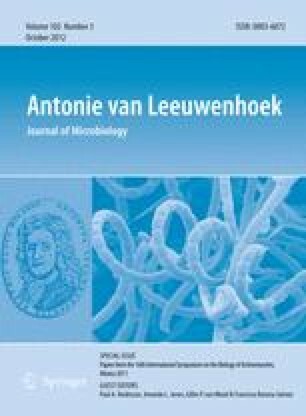 From these studies the picture emerges that the proteolytic systems of lactococci and lactobacilli are remarkably similar in their components and mode of action. The proteolytic system consists of an extracellularly located serine-proteinase, transport systems specific for di-tripeptides and oligopeptides (> 3 residues), and a multitude of intracellular peptidases. This review describes the properties and regulation of individual components as well as studies that have led to identification of their cellular localization. Targeted mutational techniques developed in recent years have made it possible to investigate the role of individual and combinations of enzymes in vivo. Based on these results as well as in vitro studies of the enzymes and transporters, a model for the proteolytic pathway is proposed. The main features are: (i) proteinases have a broad specificity and are capable of releasing a large number of different oligopeptides, of which a large fraction falls in the range of 4 to 8 amino acid residues; (ii) oligopeptide transport is the main route for nitrogen entry into the cell; (iii) all peptidases are located intracellularly and concerted action of peptidases is required for complete degradation of accumulated peptides.